Spend your holiday in the hinterland town of Boissano in Liguria, Italy and visit the wonderful old city. The olives take an important place in the lives of the 2,000 residents. A memorial plaque near the town hall, right next to an olive tree, even proclaims that the residents of Boissano have dedicated their lives to olive farming. The parish church St. Maria Magdalena is another interesting sight. It sits at the edge of the village in a central position to the parishes, providing for good access for all mass attendants. Be sure not to miss the traditional festivals that take place in Boissano every year. Visit the patron saint’s feast of Saint Mary Magdalene on 22nd July, or celebrate the religious feast of Saint Peter on the first Saturday of August. The country party is another highlight. This annual celebration takes place on the Sunday after Pentecost in the garden of the St. Peter chapel. Boissano was founded in the Middle Ages and was property of the bishops of Albenga. Boissano became autonomous in the 13th century, together with other villages. In 1386 one part of the region around Boissano was given to Pope Urbano VI, and Boissano itself became property of the Republic of Genoa, but it was allowed to retain its autonomous administration. In 1797 Boissano reverted back to the Ligurian Republic during the French rule. From 1805 onwards Boissano was part of the First French Empire. In 1861 the village was integrated into the Italian kingdom. From 1973 to 2011 Boissano formed part of the mountain community of Pollupice and Ponente Savona. Boissano is one of the villages in the province of Savona which lies in the Liguria region. 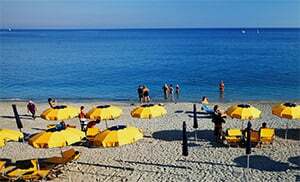 There are several other villages near Boissano, for example: Pietra Ligure (6.7 km), Loano (5.6 km) and Borghetto Santo Spirito (5.5 km). Take the E80 highway exit to Borghetto Santo Spirito. Turn right onto Via Canepari and follow it until you see the SP25 branching off to Boissano.